Lucky Man's Blog: Thou whoreson zed! Shakespeare, anyone? Ah, the pleasures of delving into the riches of the Bard! when most I play the devil. Maybe I should repeat that to the blind date who changed her mind about a follow up date that we planned because I didn't give her all the details of the date fast enough? 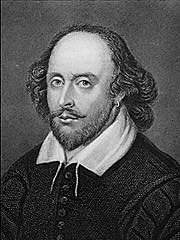 So, what are your favorite Shakespearean quotes? And be quick about it, thou thou unnecessary letter! The city I live in is famous for a theatre that puts on Shakespear's plays. We get people from all over Canada and the United States coming to watch them. I read Shakespear every year in school for 8 years. Thou canst not be then be false to any man." "I do desire we may be better strangers." That's my favorite...dying to use it on somebody at work!!! My favorite from my favorite sonnnt, #116. I was trying to find this quote which I remember from studying King Lear long ago and found your comment in my Google search. The Bard did not actually invent the notion that 'z' was a worthless letter. Rather he was referencing an argument of his time over the addition of said letter to the English alphabet. We still use 's' to form the /z/ sound (realise, his, ways...) and the argument was (is?) do we really need 'z'? Lear evidently (and anachronistically) thinks not!